We specialize in developing critical thinkers to meet the demands of a diverse and global society in the 21st century and beyond. Thanks to our carefully constructed Montessori curriculum, students emerge from MLK Montessori as critical thinkers who are independent, curious, compassionate, and ready for kindergarten. Our curriculum is guided by standards. At MLK Montessori, we ensure that all of our students develop to their fullest potentials — socially, emotionally, physically, cognitively, and academically. We carefully design students’ learning experiences so that they correlate with Indiana’s early learning standards in the areas of English/language arts, mathematics, social emotional skills, approaches to play and learning, science, social studies, creative arts, and physical health and growth. Our curriculum is STEM-focused. MLK Montessori teachers purposefully expose students to STEM (Science, Technology, Engineering, and Math) activities. Early exposure to STEM supports children’s overall academic growth, develops early critical thinking and reasoning skills, and enhances later interest in STEM study and careers. Preschool is the perfect time to begin STEM exploration, as there are no greater natural scientists and engineers than young children. MLK Montessori’s high-quality learning environment provides children with the opportunity to build upon their natural inclination to explore, to construct, and to question. Our curriculum builds cultural awareness. A rich, cultural curriculum is essential to Montessori education. At MLK Montessori, students develop a global perspective through the exploration of geography, science, botany, zoology, history, art, and music. As students learn about history and world cultures, they also begin to see the similarities of people throughout the world and come to see themselves as occupying a place in a larger historical context. In addition to the cultural curriculum offered in each classroom, MLK Montessori also has a bilingual classroom, where student of any background can develop Spanish-language skills. Our curriculum fosters peace. A Montessori classroom is uniquely harmonious and peaceful. On a daily basis, teachers offer mini-lessons centered on courtesy, politeness, and conflict resolution. Through these examples and through gentle guiding, students are given the tools they need to calmly navigate their environment and social landscape, to communicate respectfully, and to peacefully solve problems. Our curriculum harnesses peer learning. 3-, 4-, and 5-year-old children can be found in each of MLK Montessori’s five classrooms. These multiage grouping are a hallmark of the Montessori approach to education and have been shown to foster peer learning. In multiage classrooms, the older students enjoy their roles as mentors, guiding younger students through activities and topics that they – the older students – have already learned. As they work with the younger students, these older students are able to review and truly master the concepts they are teaching. Meanwhile, the younger students benefit from having role models to emulate and admire. Younger students are also able to preview the more challenging activities that they, too, will eventually be able to tackle. 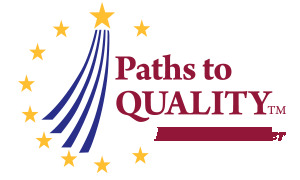 MLK Montessori School is a Path to Quality™ Level 4 provider and is accredited through The National Association for the Education of Young Children (NAEYC). Classes operate Monday through Friday from 8:30 am to 3:30 pm year-round, and before- and after-school care is also available.